If you find yourself on Sixth Street on a Thursday looking for a great time, be sure and check out The Velveeta Room. Located next door to Esther&apos;s Follies, this small-but-mighty venue offers up some of the best stand-up in Austin. 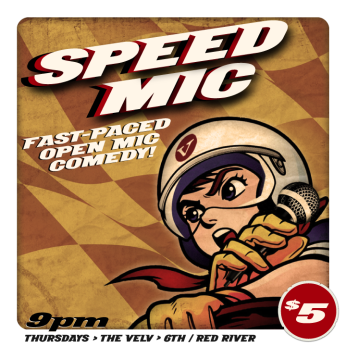 If you are looking to cram as much comedy into one sitting as possible, then Speed Mic at 9 p.m. on Thursday nights is just the place for you! Speed Mic is a whirlwind comedy show featuring tons of comedians at rapid fire pace. Each set is a maximum of five minutes, thus ensuring that you discover the best and brightest of ATX with no lag and no drag. You can catch amazing locals like John Buseman and my personal favorite, Christina Parrish. The show usually starts with brand new faces and ends with the pros, and it is open to one and all. If your friends think you&apos;re funny enough to be doing stand-up, then you should sign up here! If none of your friends think you&apos;re funny, but you find yourself hilarious, you can sign up here too. Afraid of taking the stage? No problem. The Velveeta Room theater is small and dark with plenty of seating and tables. You are encouraged to bring in food if you would like, and drinks are cheap and plenty. I am willing to bet that you will hear some real groaners, but I can confidently guarantee you will laugh. At least once. What else do you need with only a $5 cover?